Public confidence in the police is boosted by the sight of mounted patrols, according to British research. Researchers set about measuring the value of mounted police units in Britain in an 18-month study and found that the animals made great police ambassadors. They found that the high visibility of the police horses and riders on neighbourhood patrols boosted public confidence in the police. In trials, the researchers from the University of Oxford and the independent research institute, RAND Europe, observed that mounted police units generated around six times more public interest than foot patrols over the same period, although most of these interactions were brief. The number of longer conversations was similar for both mounted police and foot patrols, the researchers found. Over half of the residents questioned at one trial site in Gloucestershire, interviewed after the patrols had taken place, said they had noticed mounted units in their area. This was the highest proportion of respondents to report they had noticed mounted units in their neighbourhood. During the study, the researchers assessed the impact of mounted units in different roles. They examined public reactions to mounted units on neighbourhood patrols, a music festival, at football matches and public demonstrations. 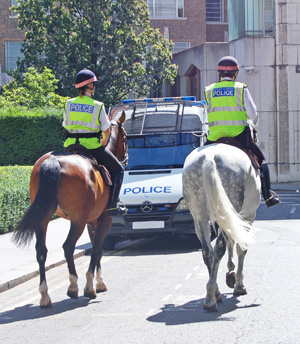 Neighbourhood patrols by pairs of mounted police officers were trialled in three areas in Gloucestershire and London in March 2014. Interviews with police at the start of the project suggested that mounted units were broadly viewed as a resource for crowd control. However, the new research shows mounted units have substantial value in other scenarios, too, particularly in a neighbourhood policing role. Mounted units were found to help build positive relationships with the public, acting as an “ice-breaker” for encouraging greater interaction between police officers and members of the public. Public surveys also tested whether the mounted unit patrols had an effect on public trust and confidence in the police. The researchers found that the use of mounted patrols bolstered trust and confidence in the trial sites, when compared to opinion in three control sites that did not receive mounted patrols. The size of this effect amounted to a greater than 10 percentage point shift in opinion, on some measures. At the Glastonbury Festival in June 2014, the researchers also observed more than three times more interactions between festival-goers and mounted police than with officers on foot, with most of these interactions being positive. “In community settings, the horse and rider combination appears to act as a sort of ambassador and ‘ice-breaker’ for the police,” said study co-author Dr Ben Bradford, from the Centre for Criminology at the University of Oxford. “People come up to say ‘hello’ or to make a fuss of the horse before having a quick conversation with the officer. “Although most of the exchanges we saw were brief, they tended to be very friendly, and the patrols increased police visibility. The report highlighted that mounted units also played a unique role at crowd events where disorder was likely. It said they appeared to be able to intervene when other resources, such as police on foot or in vehicles, would be ineffective or even risked aggravating the situation. Mounted police at football matches were found to have a small, but statistically significant effect on disorder levels. However, the report was cautious about overestimating the need for mounted police at all crowd events, saying it was difficult to attribute successful outcomes solely to the presence of mounted units. Fellow co-author Dr Chris Giacomantonio, a researcher with RAND Europe and the University of Oxford, said: “We have shown for the first time how the value of mounted units can be systematically measured and demonstrated. The study noted that the number of mounted sections across England, Scotland and Wales had fallen from 17 in 2012 to 12 in 2014, raising a number of questions about both local and national policing capacity. The report stressed that it did not set out to recommend to forces how they spent their budgets or whether they should have mounted units. Instead, it provided systematic evidence on the demonstrable and measurable impact of mounted police units in different scenarios. Commenting on the findings, the national lead for mounted policing, Deputy Chief Constable Rod Hansen, said: the study provided the police with new evidence suggesting that mounted units still had uses in modern policing, particularly in neighbourhoods. The directors of finance at four constabularies, who took into account the costs of training, equipment purchases, feeding and vets bills, provided data to the project suggesting that the annual cost of a mounted police officer is around £15,500 to £22,000 above core costs for keeping an officer in the field on an annual basis. The report estimated that a mounted police officer costs about £6550 more each year than a comparable police officer, such as a dog handler or weapons officer, although this differential varied widely between forces. The study was commissioned by the Association of Chief Police Officers, with the support of the College of Policing, the Police Federation and several police forces. They received funding from the Economic and Social Research Council, the John Fell Fund at the University of Oxford, and Avon and Somerset Constabulary. The findings were presented this week at the national mounted policing symposium at the University of Oxford.